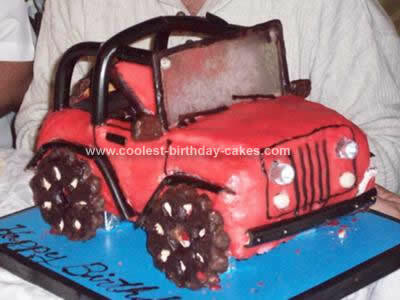 My brother in law was having his 40th birthday, and his wife asked me to make him a cake in the shape of a jeep. I wanted it to be really special, so I looked at pictures of real jeeps and the whole family helped with suggestions and ideas. The cake is a basic chocolate cake, made in 3 9X13 inch pans and stacked up (with a layer of icing as “glue”) in order to get the height. My husband cut a piece of wood for the body of the car to sit on and I lifted it off the blue tray with 4 blocks of wood covered with foil. They’re hiding behind the wheels. I bought ready made sugar dough and after covering the cake with a buttercream icing, I rolled out a thick layer of sugar dough and covered the cake. It needed a little shaping on top to make the “hood”. Then my children got the job of painting it red with a paint made of food coloring and powdered sugar and water. They painted a square shape at the top of the cake with chocolate icing to represent the inside of the car. The windshield is made of clear colored hard candies, crushed and melted down in the oven in a small pan. (Don’t forget to grease the pan first or you’ll never be able to pop the candy back out after it hardens). All the black “vinyl” is licorice. I put a piece of wire hanger through them to bend them into shape, and also to stick them into the cake. The wheels were a stroke of luck. I was prepared to use any big round cookies or even to bake some special, but we just happened to find these that look just like wheels, and I dipped them in melted chocolate. The seats are plain wafers covered in the red icing with a chocolate icing border. The mirrors are toffees covered in chocolate on one side and yellow icing on the other. They are stuck in with toothpicks. 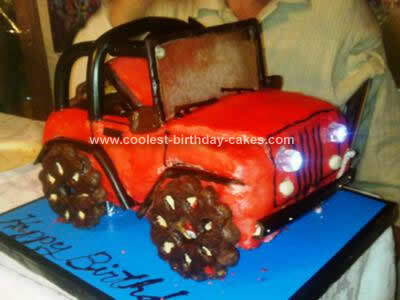 The best part about the cake are the head lights and tail lights. I bought some cheap flashlight keychains and turned them on and stuck them into the cake just before bringing it to the table. (The back ones are colored red with a marker). 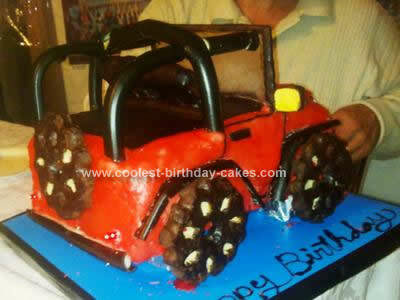 This Homemade Jeep Birthday Cake was not an easy cake to make, and I needed the whole family’s help, but it sure was a hit! I was just wondering what you made the roll bars out of?